These bank stocks pay low dividends that won't attract any income-seekers, but it's for the right reasons. Ever since the financial crisis, some banks that were former dividend powerhouses have been paying a fraction of their historical yields. At first glance, three banks in particular that appear to have terrible dividends are Bank of America (NYSE:BAC), Citigroup (NYSE:C), and Goldman Sachs (NYSE:GS). However, the dividend yields of these banks only tell half the story -- here's the other half. Bank of America shareholders got absolutely crushed during the financial crisis, but the bank has come a long way since then and continues to improve. The bank's asset quality has improved tremendously, expense reductions have made it more efficient, and it's emerged as a leader in banking technology. Plus, the bank's capital levels have improved to the point where it could handle any adverse conditions the economy throws its way. Because of this, Bank of America recently won approval to increase its dividend to $0.075 per quarter, which translates to a halfway-decent 1.9% yield at the current share price. However, the real story is that Bank of America is returning $8 billion in capital to shareholders this year, but just $3 billion is in the form of dividends. The other $5 billion is wisely being spent on share buybacks to take advantage of the bank's depressed valuation. As of this writing, the bank trades for an incredible 33% discount to its $23.67 per share book value, so the bank can literally buy back its own assets for $0.67 on the dollar. Because of its much-improved financial condition and shareholder-friendly management, Warren Buffett plans to keep Bank of America a part of Berkshire Hathaway's strategy for some time. Berkshire holds warrants to buy 700 million shares of the bank, which technically makes it Berkshire's fourth-largest stock investment, and as Buffett himself put it, "One we value highly." Like Bank of America, Citigroup has come a long way since the financial crisis. It has shed the majority of its low-quality assets, efficiency has improved, and capital levels are much higher. Plus, the bank's good assets have shown promising growth. Also like Bank of America, Citigroup trades for a big discount to its book value. In both cases, below-average profitability (for now) is weighing down the stocks' valuation, but this could change quickly when interest rates begin to normalize. My colleague John Maxfield recently published a great article discussing why these two banks are so cheap, and what could happen in the future. For now, Citigroup trades for a 35% discount to book value, making it the "cheapest" big U.S. bank stock. The bank's mediocre 1.35% dividend yield is unlikely to attract any income investors, but it's more than triple what the bank paid last year. What's more, Citigroup plans to spend up to $8.6 billion to buy back shares over the next year -- more than 6.2% of the total, based on the current price. Unlike the other two stocks on the list, Goldman Sachs has never really been a high-dividend stock, as you can see in this chart of the pre-financial crisis years. 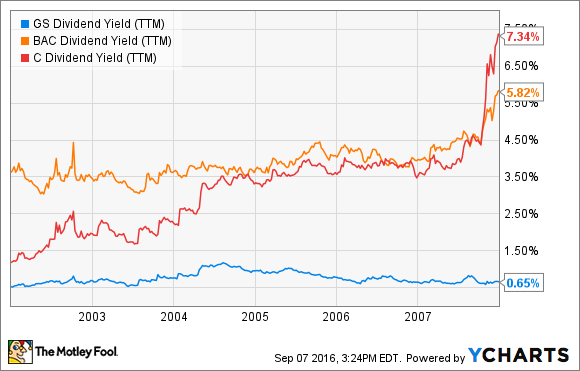 Its current 1.54% yield is actually on the high end, historically speaking. GS Dividend Yield (TTM) data by YCharts. Like the other two banks' current strategy, Goldman Sachs' preferred way of returning capital to shareholders is through buybacks, and it does so aggressively when it feels shares are attractively priced. Since 2011, Goldman's outstanding share count has dropped by 20%, and in 2015 alone, the company spent $4.2 billion repurchasing its shares -- impressive when you consider that Goldman's entire market capitalization is less than $69 billion. Just like the other two banks, Goldman is trading at a discount to its book value, but not by as much. As I write this, the bank trades for about 4% less than its book value. However, as long as the bank's management feels the stock is undervalued, I wouldn't expect any change in the high-buyback, low-dividend strategy. The bank has done a great job of remaining profitable in a tough global investment banking environment, mainly thanks to its excellent job of expense reduction. For the most recent quarter, Goldman's revenue fell by 13% year over year, but earnings per share increased by 88% at the same time. The dividends paid by these three banks aren't going to excite any true income investors. However, if you have a long time horizon, not only should you not mind the lower dividends, you should be thrilled about them. These three banks are wisely taking advantage of their depressed share prices and are maximizing shareholder value by emphasizing buybacks. So, which is best for you? A strong case can be made for all three of these banks, especially from a long-term perspective. Personally, Bank of America is my favorite of the three right now -- it's simply too cheap to ignore, and its greatly improved efficiency could help it catapult to strong profitability once interest rates normalize. In fact, Bank of America has become my biggest bank investment. My next favorite of the group is Goldman, which is also a big part of my portfolio. I don't own Citigroup (yet), but not because it's a bad investment; I just happen to like the other two better.